The wait is over! The royal baby is finally here. 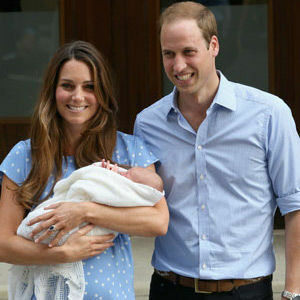 After nearly 14 hours of labor, the Duke and Duchess of Cambridge welcomed a baby boy, who weighed in at 8 lbs, 6 oz. Sticking with the theatrical traditions of the palace, the birth of the little boy was announced with an official bulletin signed by the Duchess' medical team and placed on a wooden easel in the forecourt of Buckingham Palace. "Her Royal Highness The Duchess of Cambridge was safely delivered of a son at 4.24pm. The baby weighs 8 lbs 6 oz. The Duke of Cambridge was present for the birth." "Her Royal Highness The Duchess of Cambridge has been admitted to St. Mary's Hospital, Paddington, London in the early stages of labour." "The Duchess traveled by car from Kensington Palace to the Lindo Wing at St. Mary's Hospital with The Duke of Cambridge." UPDATE: The Prince of Cambridge made his official debut to the world just over 24 hours after he was born. The proud new parents (both appropriately dressed in blue) greeted the press and showed off their little bundle of joy before leaving the hospital to head home. Kate was wearing a light blue dress with white polka dots, similar to the teal dress worn by Princess Diana when she left the hospital with a newborn Prince William. There is no word on the baby's name yet, but his formal title will be His Royal Highness Prince of Cambridge. We just can't get over this cute royal family! We wish the Duke and Duchess the best of luck as new parents!